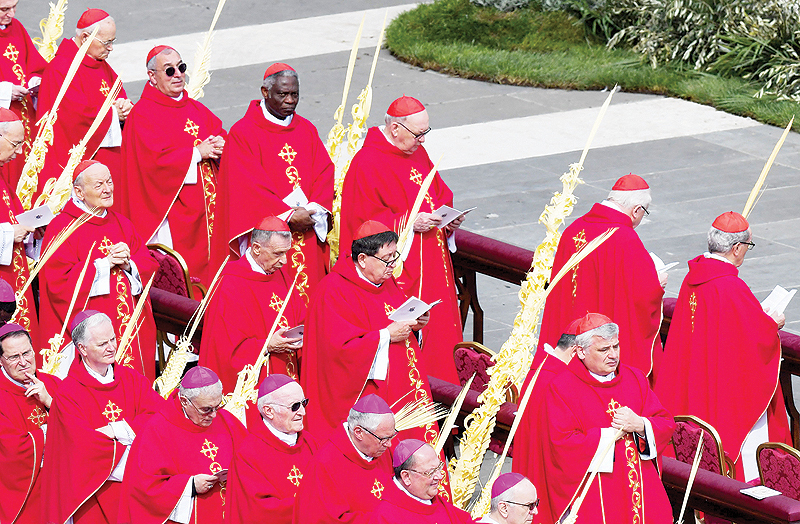 VATICAN CITY: Tens of thousands of people waved palm and olive branches in St Peter’s Square on Palm Sunday as Pope Francis led the world’s Catholics into Holy Week commemorations ahead of Easter calling for the Church to be humble. Palm Sunday is when Christians mark the day the Bible says Jesus rode into Jerusalem and was hailed by the crowd as Messiah, only to be crucified days later. After a long procession across the square accompanied by dozens of bishops and cardinals, and following gospel readings, Francis said in his homily that it was important to resist the temptations of triumphalism and remain humble. “Joyful acclamations at Jesus’ entrance into Jerusalem, followed by his humiliation. Festive cries, followed by brutal torture. This twofold mystery accompanies our entrance into Holy Week each year,” he said. The Church itself had to resist triumphalism and spiritual worldliness, he added, calling them “the most treacherous temptation threatening the Church”. At the end of the two-hour service, Francis asked the crowd to pray for peace, particularly in the Holy Land and all of the Middle East. Palm Sunday marks the start of a hectic week of activities leading to Easter Sunday, the most important day on the Christian liturgical calendar.